Cedar shake shingles are a very popular roofing choice for many homeowners looking for wood shingles that are both beautiful and durable against severe weather. When working with wood you will always have to expect additional treatment and maintenance costs when compared to other popular alternatives like asphalt shingles. All roofing materials have pros and cons associated with them including these cedar shake shingles but most homeowners find their pros outweigh the cons. The individual decision to go with cedar shingles for your roof usually depends on the personal preferences of the owner. Other factors that can affect this decision can be climate, location and their commitment to maintenance. The greatest advantage for cedar shakes is their inherent beauty. The shingles age gracefully, adding a style and look you can’t get with artificial shingles. Another benefit is the savings in costs as they will not need to be replaced for 10 years or more. If you’re looking for shingles that can handle a storm then these are greate against rain, wind, hail and snowstorms! The natural insulation properties of wood make them great for energy efficiency as well. The properties of the wood naturally keep heat in during winter and cooler temperatures during the summer. This will help with any energy conservation efforts you may have in your home and significantly help with the heating bill. If you are concerned with being eco-friendly we can find you sourced materials that adhere to healthy foresting practices. Reforestation and roofing are an important cycle and we will work with only the best suppliers in the Virginia area. Like with all wood home materials there is always a maintenance and upkeep fee associated with protecting and maintaining their beauty and effectiveness. Cedar shingles are more expensive and cost more to install than asphalt shingles. Cedar shingle roofs also require regular maintenance to prevent moss, mold and mildew from growing on them. Regular inspections and treatment can minimize these issues. 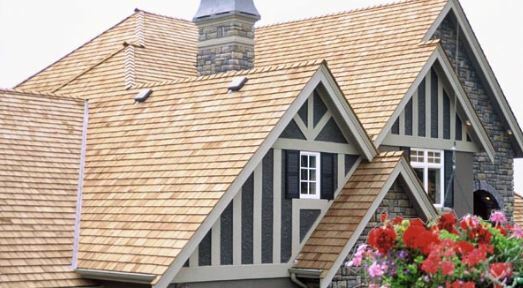 The choice to install cedar shake shingle roofing comes down homeowner, Beckworth LLC would be happy to help you make the best decision by comparing other options with you before moving forward with the process. You can call us for a free estimate any time at (703) 570-6777 or send us a message here.